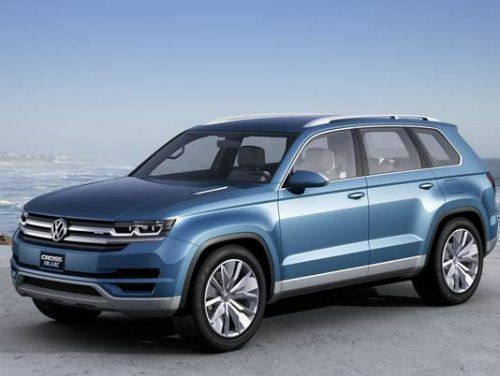 At NAIAS today, Volkswagen showed off a new SUV, the CrossBlue, that could see production in two years, showcasing a plug-in diesel hybrid-electric powertrain, and then said the diesel-hybrid will not be going to market in a classic "show but don't touch" maneuver. The new CrossBlue from VW is a crossover that would fit somewhere between the Tiguan and Touareg. It may go to production in the U.S. in the next two years, Veedub promises, which means the CrossBlue name will likely change to something starting with "T" for our market. When VW unveiled the new concept, however, most of the attention was on the proposed diesel-electric powertrain option - a sort of dream hybrid that combines all of the efficiency of a clean diesel engine with all of the economy that a plug-in electric hybrid promises. The Volks forecasts a 35 mpg city/highway combination and an 89 mpg-equvalent (MPGe) for all-electric mode, which it could sustain for about fourteen miles at city speeds. For a mid-sized crossover, those are some steamy numbers. Then Volkswagen promptly told the droolers to mop up. The plug-in diesel-electric would be too expensive to produce, so don't count on seeing one. Wow. Talk about getting to third base and then being shut down when dad steps out on the porch. Were it to be made, however, the VW CrossBlue would feature a 4-cylinder diesel of the high efficiency that the Volkswagen Group has won Green Car Awards for in the past coupled to a pair of electric motors providing true four-wheel-drive. Batteries are under the floor, running all the way along the length of the crossover, creating a Volt-like hump along the center of the vehicle. This means pilot seating for all six passengers (yes, 3 rows) rather than a more accommodating 7+ seating arrangement, which would slightly limit marketability. The high expense blocking production comes in twain. First, the CrossBlue design would combine two of the most expensive powertrains: diesel engines and batteries. Second, the crossover's design limitations limit interior space and seating - a huge "no no" in this segment, which seeks to maximize interior space while limiting vehicle footprint. So the reasons for VW not building the CrossBlue as a diesel-eelctric plug-in are plain and easy to understand. Which leaves just one question: why did they bother showcasing one if they aren't going to make it? Well, it got me to write about it and you to read about it. Right? Not going to do it, ain't gonna happen! VW has been doing a lot of talking these past few years but they have a few good products they can work with right now, the Jetta, now in hybrid trims and whatever e-Golf they will finally get around to doing. A Diesel PHEV is something we all ask about and a few companies flirt with the idea. So far Volvo is the only one doing something about it. Ya, it's an awesome idea, but an expensive proposition. they should have called it the blue ball.